Ultrasounds and ionizing radiation are extensively used for diagnostic applications in the cardiology clinical practice. This paper reviewed the available information on occupational risk of the cardiologists who perform, every day, cardiac imaging procedures. At the moment, there are no consistent evidence that exposure to medical ultrasound is capable of inducing genetic effects, and representing a serious health hazard for clinical staff. In contrast, exposure to ionizing radiation may result in adverse health effect on clinical cardiologists. Although the current risk estimates are clouded by approximations and extrapolations, most data from cytogenetic studies have reported a detrimental effect on somatic DNA of professionally exposed personnel to chronic low doses of ionizing radiation. Since interventional cardiologists and electro-physiologists have the highest radiation exposure among health professionals, a major awareness is crucial for improving occupational protection. Furthermore, the use of a biological dosimeter could be a reliable tool for the risk quantification on an individual basis. Over the last 30 years, medical cardiology imaging has rapidly grown, becoming an essential part of the cardiology clinical practice. Imaging procedures include conventional imaging tests such as echocardiography, radionuclide imaging, and angiography as well as a newer imaging techniques such as emission computed tomography and magnetic resonance imaging which promise to expand diagnostic capabilities . These techniques widely differ not only for what concerns costs, availability and technical information, but they also differ in environmental and health hazards. Many cardiac procedures can deliver high radiation doses to the clinical staff . This exposure may represent a significant health risk, resulting in deleterious clinical implications which can affect not only the personnel involved, but also their progeny [3–5]. Unfortunately, many physicians are unfamiliar with radiation biology or the quantitative nature of the risks and, frequently, ultrasound and ionizing radiation risks are misunderstood [6–9]. The purpose of this paper is to discuss the published evidence on health effects of cardiac imaging procedures employing ultrasound and ionizing radiation. Ultrasound imaging, also called sonography, is a method of obtaining human body images through the use of high frequency sound waves. Ultrasounds are mechanical vibrations with frequencies above the human limit of audibility. The use of ultrasounds in order to obtain images for medical diagnostic purposes, typically employs frequencies ranging from 2 MHz to about 12 MHz . Ultrasound does not use ionizing radiation, and it is the preferred image modality for monitoring both pregnant women and their embryos or fetus . In contrast to ionizing radiation, which can damage biological materials by dislodging electrons from atoms and molecules, ultrasounds do not cause ionisation. They usually interact with human tissue primarily by generating heat, but also non-thermal effects which are ascribed to cavitation (i.e. micro-bubble) . The process of cavitation includes ultrasounds mechanical effects which lead to hydrodynamic breaks of hydrogen bonds and oscillation of hydrogen ions, and chemical effects produced by the occurrence of free radicals in intercarionic space in the process of cavitation (Figure 1). Theoretically, these free radicals may interfere with DNA, causing chromosomal damage. Indeed, ultrasounds of diagnostic intensities induced detectable DNA damage in animal cells [12, 13]. 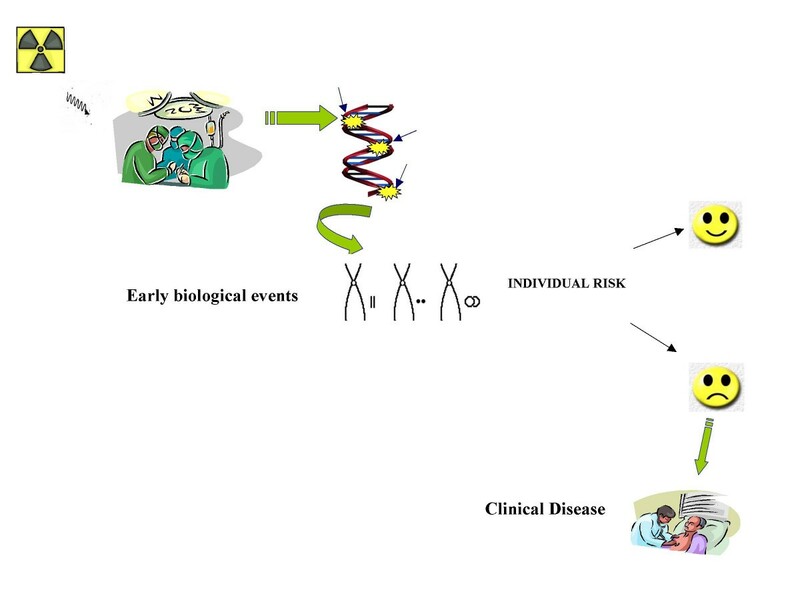 Currently, there is a body of studies on human DNA damage from exposure to therapeutic and diagnostic ultrasounds [14–20]. In particular, Stella et al. reported that therapeutic ultrasound induce a significant increase in sister chromatid exchanges (SCEs) in human lymphocytes after treatment both in vitro and in vivo. 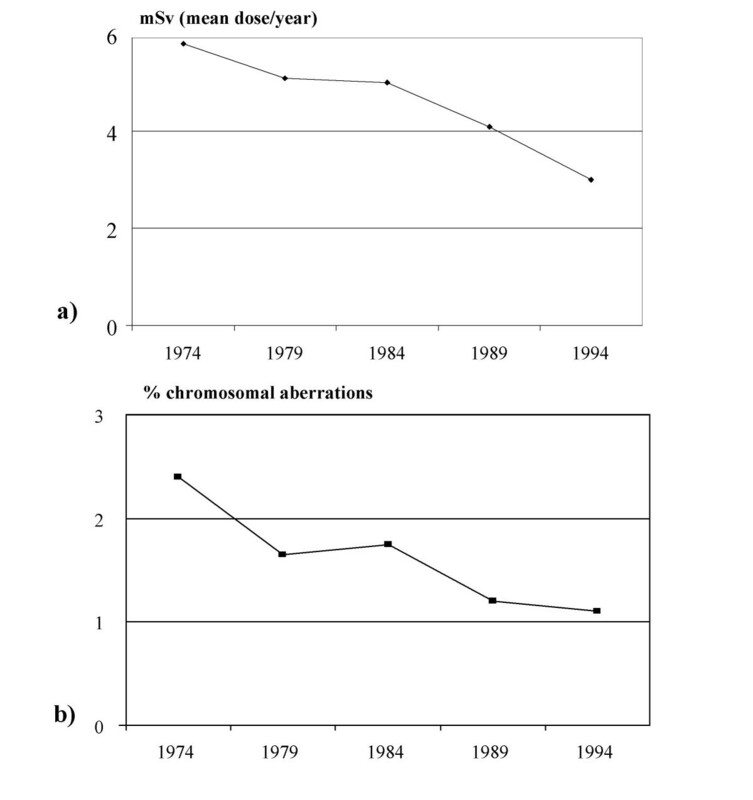 In the same study, no increase in chromosomal aberrations was observed during and after ultrasound therapy . Subsequently, some reports on human cells indicated that ultrasound was not able to induce SCEs or chromosomal damage (Table 1). Thus, there is at present no indication that exposure to medical ultrasound is capable of inducing genetic effects and representing a serious health hazard for clinical staff. However, very little information is available on the genetic effects of individuals occupationally exposed to chronic ultrasound. Medical staff can be exposed to hand-transmitted ultrasound waves in the work-place. At high acoustic pressure, ultrasound is capable of causing rapid bubble which grow and collapse among them (a) and cells (b). 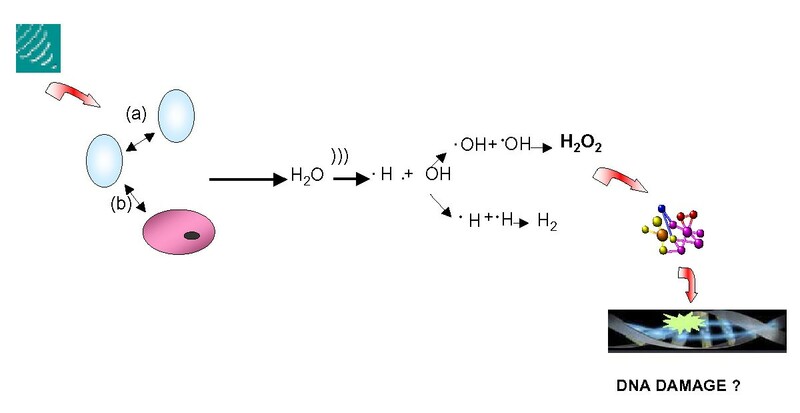 This mechanism results in the production of sufficient energy to disrupt chemical bonds and produce reactive free radicals, that may interfere with DNA. SPPA intensities from 15 to 135 W/cm2. Unit working with colour Doppler US (transducer frequencies 2.5–7.5 MHz. Indeed, ultrasound sources do not transmit acoustic energy into air, and only low level ultrasound reaches medical personnel through handling of the probe . Probably, occupational exposure to ultrasound occurs during training procedures . In fact, medical personnel often apply diagnostic ultrasound to themselves during training or during technique demonstrations . Consequently, ultrasound is not harmful like the other types and sources of radiation. However, a recent investigation indicated that medical personnel from a cardiology unit working with colour Doppler ultrasonic equipment had an increased genotoxic damage compared to the control subjects . Therefore, this observation requires further studies in order to determine if chronic exposure to ultrasound might induce genotoxic effects. Ionizing radiation is known to cause harm. High radiation doses tend to kill cells, while low doses tend to damage or alter the genetic code (DNA) of irradiated cells. The biological effects of ionizing radiation are divided into two categories: deterministic and stochastic effects. Deterministic effects, such as erythema or cataract, have a threshold dose below which the biological response is not observed [23–25]. Some interventional procedures with long screening times and multiple image acquisition (e.g. percutaneous coronary intervention, radio-frequency ablation, etc) may give rise to deterministic effects in both staff and patients [26, 27]. A stochastic effect is a probabilistic event and there is no known threshold dose. The likelihood of inducing the effect, but not the severity, increases in relation to dose and may differ among individuals. In fact, the effect of low doses of radiation -less than 50 mSv- do not cause an immediate problem to any body organ, but spread out over long periods of time after exposure. The biological effects are at DNA level and they may not be detected [23–25]. The cell has repair mechanisms against damage induced by radiation as well as by chemical carcinogens. 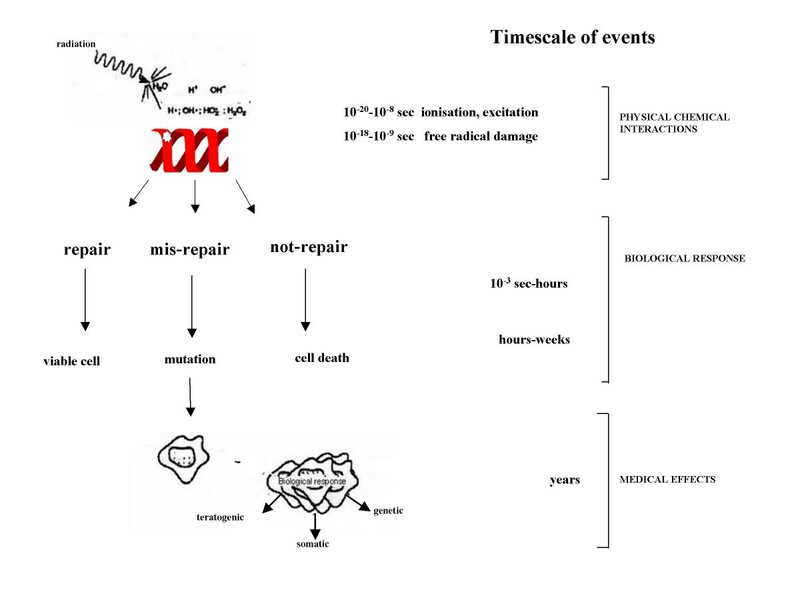 Consequently, biological effects of low dose radiation on living cells may result in three outcomes: (1) injured or damaged cells repair themselves, resulting in no residual damage; (2) cells die; or (3) cells incorrectly repair themselves resulting in a biological change (Figure 2). Such biological changes include the development of cancer and genetic defects in the future children of exposed parents. At present, however, the effects of low-level exposure remain uncertain . The associations between radiation exposure and the development of cancer are mostly based on populations exposed to relatively high levels of ionizing radiation (e.g., Japanese atomic bomb survivors). Since extraordinary large studies are required to quantify the risks of very low doses of radiation, it is unlikely that we will be able to precisely quantify cancer risk in human populations at doses below 10 mSv . For instance, an epidemiological study of more than 5 million people would be needed to quantify the effect for a 10 -mSv dose or less . Our inability to quantify risk does not, however, imply that this risk is negligible. Furthermore, the small (and often not so small) individual risk applied to a large number of individuals, and by protracted exposures, translates into a significant public health problem). As such, the international scientific community has adopted a prudent approach and acknowledged the fact that any level of exposure could potentially lead to biological effects. A linear, no-threshold dose response relationship is used by the IRCP in order to describe the relationship between radiation dose and the occurrence of cancer . This dose-response model suggests that any increase in dose, no matter how small, results in an incremental increase in risk. Radiation damage of DNA. Damaged DNA is screened through the process of DNA repair and mismatch correction. DNA lesions that escape repair, has the ability to produce mutations, which lead to the development and the progression of both cancer and human diseases even decades after exposure. Genetic effects are the result of a mutation produced in the reproductive cells of an exposed individual that are passed on to their offspring. These effects may show up as birth defects or other conditions in the future children of the exposed individual and succeeding generation. Indeed, studies with laboratory animals have provided a large body of data on radiation-induced genetic effects . Recently, these effects have been also observed in studies of people exposed to radiation from Chernobyl disaster, radiation workers and medical radiologists who have received doses of radiation [31–33]. However, no conclusive evidence exists yet [34, 35]. The use of radiation in medicine is the largest source of man-made radiation exposure. According to the latest estimation of the United Nations, an average of 2.4 mSv/year comes from natural sources . In western countries, the exposure dose from medical radiation corresponds to 50 to 100% of the total natural radiation. In 1997, the German Federal Office for Radiation Protection reported 136 million x ray examinations and 4 million nuclear medicine diagnostic tests, resulting in a mean effective dose of 2.15 mSv per person per year . Cardiac and interventional procedures account for a large percentage of nuclear and radiological examinations . Of all radiological examinations, 28% are arteriographies and interventions. An additional 2% derive from chest X-rays and 37% from CT: many of them are cardiological referrals. Regarding nuclear medicine, 22% are cardiological scan. These percentages are likely higher now, since the use of cardiac and interventional procedures is increasing. Cardiac ionizing procedures expose both patients and medical staff to the highest radiation levels in diagnostic radiology, and recently, as the number of diagnostic and interventional cardiac catheterisation procedures has greatly increased, serious radiation induced skin injuries and an excess of cataract development have been reported in exposed staff [37–39]. Furthermore, it has been suggested that fluoroscopic procedures may be a health hazard and increase the risk for brain tumours in interventional cardiologists . Today, interventional cardiologists represent, indeed, the most important group of exposed among professionally exposed physicians [41, 42]. As known, the limit on effective dose for exposed workers should be 100 mSv in a consecutive five year period, subject to a maximum effective dose of 50 mSv in any single year. Radiation dose limits to adult occupational workers provided by the International Commission on Radiological Protection (ICRP) are shown in table 2. Recommended occupational dose limits by International Commission on Radiological Protection (ICRP). As a matter of fact, the head dose sustained by cardiologists may reach 60 mSv per year, and may in some cases exceed the occupational limit of 150 mSv per year recommended for the lens of the eye . However, the correlation between occupational doses and staff radiological risks is not simple, and it is very dependent on equipment, the specialist, and protocols followed throughout the procedure . Many factors can influence occupational doses for the same radiation dose imparted during cardiac procedure. One of the most important factors is that protection tools are available in catheterisation laboratories and are appropriately used . In addition, another likely reason is a lack of knowledge, information and training in radiation protection . Importantly, a recent survey showed that that most of cardiologists do not correctly evaluate the dose exposure, the medico-legal regulation, the environmental impact and individual bio-risks of the radiological investigations . As shown in table 3, this surprising lack of knowledge of both dose and clinical risk of commonly performed ionising test examinations, is not at all restricted to cardiologists, and seems to be democratically spread across all specialties – from surgeons to orthopaedics, to paediatricians [6–9]. Radiation doses for common radiological investigations. 97% of doctors underestimates dose. 5% believes that US use ionising radiation. 8% believes thatMRI use ionising radiation. Mortality risk was identified correctly by less than 5% of respondents. Almost all doctors were unable to accurately estimate the dose. Only 9% ED physicians believed that there was increased risk. Only 11%, 5%, 29% and 42% of physicians correctly identified environmental impact, individual bio-risks, dose exposure and legal regulation, respectively. Probably, this unawareness has its root in the difficult perception of a long-term risk associated to radiation exposure. In particular, the perception of cancer risk, which can have a latency period of many years after exposure, is often elusive. Furthermore, the exact risk at very low doses to a specific individual is further complicated by many factors, such as carcinogenic agents in our environment, cigarette smoke, diet and genetic background. However, a recent study has estimated that from 0.6% to 3% of all cancers are due to medical X-rays . These figures are impressive but may largely underestimate the true risk, since they are referred to radiological data concerning the 1991–1996. Taking into account current radiological activities, medical radiation is likely to account for at least 20% of cancer in developed countries . With regard to occupational exposure for radiologists and radiotherapists, available epidemiological studies have been recently reviewed by Yoshinaga et al . An excess risk of leukaemia associated with occupational radiation was found among early workers employed before 1950, when radiation exposures were high. In addition, several studies provided evidence of a radiation effect for breast and skin cancer. To date, there is no clear evidence of an increased cancer risk in medical radiation workers exposed to current levels of radiation doses. However, given a relatively short period of time for which the most recent workers have been followed up and in view of the increasing uses of radiation in modern medical practices, it is important to continue to monitor the health status of medical radiation workers . To the fatal cancer risk, one must add the risk of non-fatal cancer and major genetic damage transmitted to the offspring. It is relevant to underline that the long-term damage may not include only cancer but also other major degenerative diseases, including atherosclerosis [47, 48]. However, it is important to realize that many difficulties are involved in designing epidemiological studies that can accurately measure the increases in health effects due to low exposures to radiation as compared to the normal rate of cancer. Studies with very large sample size are required in order to quantify the risks of very low doses of radiation. An alternative strategy could be based on the measure of biological effects by using biomarkers as predictors of delayed health outcomes . Damage to deoxyribonucleic acid (DNA), which carries the genetic information in chromosomes in the cell nucleus, is considered to be the main initiating event by which radiation damage to cells results in the development of cancer and hereditary disease. 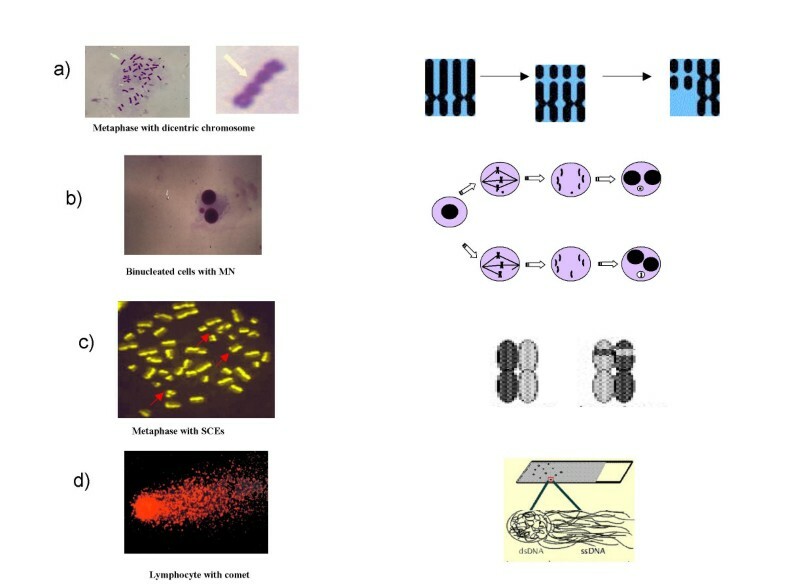 Four biomarkers (Figure 3) -analysis of structural chromosome aberrations, micronucleus assay, sister chromatid exchange analysis and comet assay- in peripheral lymphocytes are currently employed in order to study human exposure to environmental carcinogens . Among these, the test of chromosomal aberrations in peripheral blood lymphocytes has the most abundant literature validating that a high frequency of chromosomal breakage is a strong predictor of cancer risk in healthy subjects [51, 52]. Biomarkers of DNA damage in human lymphocytes: a) Structural chromosomal aberrations (CA) are typical of cancer cells, probably as a manifestation of genetic instability. b) Micronuclei (MN) can originate from chromosome breaks or whole chromosomes that fail to engage with the mitotic spindle when the cell divides. Therefore, the micronucleus test can be considered just as a real "biological dosimeter" for evaluating both numerical and structural chromosome aberrations. c) Sister chromatid exchanges (SCEs) represent symmetrical exchanges between sister chromatids; generally they do not result in chromosomal alterations of the genetic information. c) The Comet assay is an especially sensitive method for detecting DNA single-strand breaks and oxidative DNA damage in individual cells. The entity of the DNA damage is proportional to the length of the comet. During the last years, the micronucleus assay has become popular since it is fast and inexpensive, and it is considered to be a "biological dosimeter" for exposure to ionizing radiation . The importance of cytogenetic study of peripheral lymphocytes in subjects exposed to ionizing radiation has been reported for more than 20 years, especially in radiologists [54–68]. The available evidence suggests that chronic exposure to low dose radiation has a genotoxic effect on somatic DNA of professionally exposed workers (Table 4). This effect seems to be cumulative over time, although the majority of these studies failed to establish a dose-effect relationship for low doses. The absence of increase of somatic DNA damage in relation to the dose might be explained by various factors. Dosimetry records may underestimate the real dose exposure if the badges are not properly worn. The potential combined effect of other genotoxic exposures would also induce DNA damage, enhancing the effect of radiation exposure . Moreover, genetic susceptibility may account for the inter-individual differences to radiation sensitivity. Such possible susceptibility may recognize sources of variability (genetic polymorphism) in people's DNA repair gene sequence . However, it is interesting to underline that, in a group of radiologists, it has been documented an important parallelism between the decrease of the exposure to ionizing radiation in the hospitals and a reduction in the frequency of chromosome aberrations over the most recent decades  (Figure 4). This decrease was the result of an efficient protection policy among radiologists. Unfortunately, this is not the case for invasive cardiologists who need to know very well both the long-term risks and the doses involved in the large amount of examinations they prescribe and/or perform every day [40, 41]. Available only partially and variable. As matter of fact, our results and a recent monitoring of personnel working in angiocardiography laboratories in Iranian Hospitals showed a high frequency of chromosome aberrations in cardiologists s and technicians compared to unexposed subjects [68, 69]. Taken together, these evidences highlight that the use of a biological dosimeter could complement the data obtained by physical dosimetry and reduce the uncertainties of low-dose radiation risk assessment . The analysis of chromosome aberrations is the gold standard endpoint for radiation biological dosimetry. Limitations and strengths on biodosimetry have been fully discussed in the IAEA Report 405 . A possible limitation is the response to high radiation dose (> 4 Sv) where cell death and delays in progression through the cycle represents a pitfall for estimation of acute irradiation particularly when non-uniform or partial body irradiation have occurred. Moreover, the method is laborious, time consuming and requires expert skills. Scoring of micronuclei has been proposed as an alternative to conventional chromosome aberrations analysis, being more sensitive and faster . Although micronuclei method has been improved, inter-laboratories discrepancies have emphasized the need for better standardization . However, in many countries the application of cytogenetic dosimetry has yet medical-legal recognition, and it is complementary to physical dosimetry. On the other hand, the usefulness of biomarkers as early biological effects, with special concern for the prediction of cancer, has been recently emphasized . Therefore, the application of biodosimetry- that measures true cellular injury resulting from that radiation- could greatly enhance health risk, identifying susceptible individuals and enhancing the possibility of preventive measures, especially in occupational settings with a high volume of radiological activities (Figure 5). Illustration of potential use of biomarkers as early predictors of clinical disease. The evaluation of genetic effects such as chromosomal damage could be used to anticipate delayed health outcomes, providing a greater potential for preventive measures. Occupational exposure can occur in cardiological procedures which employ ultrasound and ionizing radiation. Today, there are no consistent adverse biological effects on operators caused by exposures to ultrasound. However, it is clearly necessary to continually monitor both the potential risks and safety of ultrasound exposure. In contrast, exposure to ionizing radiation may result in adverse health effect on both cardiologists directly and on their progeny. Although the current risk estimates are clouded by approximations and extrapolations, most data from cytogenetic studies have reported an enhanced DNA damage in hospital workers exposed to chronic low doses of ionizing radiation. The occupational dose of interventional cardiologists, and electrophysiologists tend to be higher compared to other medical specialists as a result of the recent increasing use of interventional techniques. On the other hand, physicians are dramatically unaware of dose, long-term risks and populations health impact caused by the use of medical ionizing radiation. Thus, a major awareness appears to be crucial in order to improve both one's knowledge on the appropriateness of protective tools and also in trying to reduce the number of unnecessary procedures. The use of a biological dosimeter could be a reliable tool for risk quantification on an individual basis.